Researchers at the University of Washington and Carnegie Mellon found that reading and comprehending metaphors had very different patterns of brain activation depending on whether statements were provided in context. 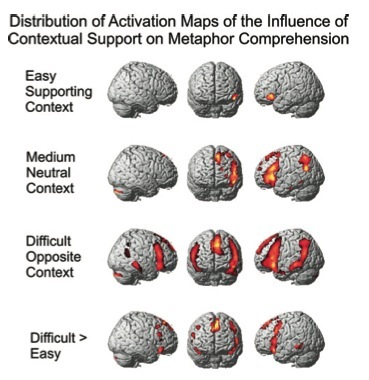 In the right context, metaphor comprehension was an easy - required much less brain work- but with neutral or opposite context, look how much effort was expended. In the opposite context, the metaphor was ironic or sarcastic.